CPH recently released The Idea and Practice of a Christian University, written by several university faculty and staff members and edited by Dr. Scott Ashmon. We asked Dr. Ashmon to answer a few questions about the book, digging into some of the topics discussed. Read the first part of our Q & A with him below. Click here to read part 2 and here to read part 3. Describe the origination of the “modern” university. How has the reality of this institution changed over time? The modern university has several defining moments, but the principal period occurred in the nineteenth century. Prior to this, universities were typically organized around core curricula of liberal arts and science courses that included topics such as classical languages, history, philosophy, music, physics, and theology. Every student took these courses, which helped them pursue truth and virtue in a holistic fashion. This also prepared them broadly for life and for the callings of service to the state or church (typically as lawyers, doctors, or pastors) that they would engage in after graduation. The rise of the German research university, with its emphasis on discovering new knowledge in discrete disciplines, deeply impacted American universities in the mid-nineteenth century and dramatically changed their orientation. This is easily seen today in the way that professors are no longer generalists but specialize in narrowly defined disciplines, students have majors, and research and publishing define educational excellence (see, e.g., the annual rankings of the “best” colleges given by U.S. News & World Report). Another defining moment was the Morrill Act of 1862, which promoted practical and professional education in public universities—specifically, the agriculture and mechanical arts (A&M) universities—with the goal of advancing industry and economics for businesses and the United States. This act, along with funds from business and industry magnates, moved universities to open up higher education to much more professional training than it had engaged in before. Both of these emphases, research and professional, are visible on today’s campuses. The once-dominant common liberal arts and science curriculum is still seen in general education (GE) courses. But most institutions, under the late-nineteenth century move to eliminate curricular commonality for individual electivity, offer students a buffet of disconnected distribution courses without an eye to how this part of the curriculum prepares students to see the truth holistically (the original meaning of university) and act upon it accordingly in their callings in life. A minority of universities have retained or regained a more holistic approach to the pursuit of truth, goodness, and beauty by means of a core curriculum. Fewer have done well at bridging the rift students often feel between their general education, which prepares them broadly for life, and their majors, which train them for a specific profession or field of inquiry. Even fewer universities help students thoughtfully and appropriately connect the Christian faith to either of these educational aspects. This is precisely where the biblical, Lutheran teachings of vocations and two kingdoms—and the historic examples of Lutheran education—become vital for Christian and public universities. What differentiates or should differentiate a Christian university from its “state” or secular counterparts? The confession that Jesus Christ is “the way, and the truth, and the life” (John 14:6) and that everything—all truth—coheres in Christ as Creator and Savior (Colossians 1:15–20) is a defining and differentiating creed for many Christian universities. So, too, is Paul’s exhortation to think on whatever is true, honorable, and lovely (Philippians 4:8). Christian universities, then, not only support the educational pursuit of truth, goodness, and beauty that arose at least as early as ancient Athens, but they also stand with the confession of the earliest Christians in and around Jerusalem that Jesus Christ is the Truth. This means that Christian universities have a unique confession of who the Truth ultimately is. They will not only profess this faith, but also—as is humanly possible—seek to understand how this Truth connects to, illumines, and shapes each academic discipline and aspect of the university. What further factors should identify a Lutheran university? 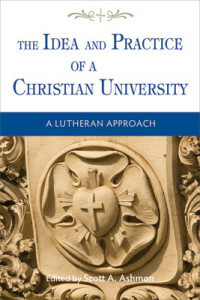 Theologically, Lutheran universities should also be identified by teachings such as sola Scriptura (“Scripture alone”), Law and Gospel, justification by grace through faith, incarnational and sacramental theology, two kingdoms, vocations, and simul iustus et peccator (“simultaneously justified and sinful”). Each of these teachings is highly applicable to the idea and practice of a Christian university. For instance, the teaching that God works in two ways in two kingdoms—the kingdom of power and the kingdom of grace—for two connected ends—temporal and eternal peace—is a rich, fundamental doctrine for Lutheran universities to embrace and embody. It helps professors, students, administrators, staff, and boards recognize that university vocations are mostly located in God’s left-hand kingdom, which is ruled by law, reason, and experience and are available to all. Here, there is much common ground with secular universities in subjects and methods of inquiry, education for vocations, grades, codes of conduct, budgets, bylaws, and the like. This teaching also highlights that the purpose of the left-hand kingdom—and the university—is not to save society or make it conform to God’s will. Instead, it is to benefit society (and nature) by promoting temporal welfare. It is also meant to serve as a “handmaiden” to God’s right-hand kingdom in defending and proclaiming the Gospel of salvation accomplished by Christ. For its part, the right-hand kingdom—ruled by grace, faith, and revelation—provides a guiding vision of life for the left-hand kingdom. The interaction of God’s two kingdoms provides a lively, durable model for how faith and learning should engage in the university. Each has its own God-given sphere of dignity and operation while also being inseparably connected to fulfill God’s ends for life.